Gregorii Nysseni Opera Online is the ultimate online critical text edition of Gregory of Nyssa's works based on all available known manuscripts, introduced with a complete discussion of the textual transmission and accompanied by extensive annotations on the biblical, classical and patristic sources, and indices. 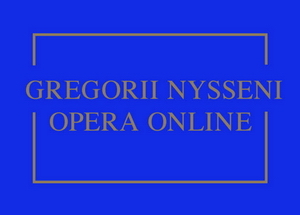 Gregorii Nysseni Opera Online consists of 60 works. Tabs on the publication’s home page list the works and their prefaces. Hyperlinks connect a work to its preface, and vice versa. Please note that De hominis opificio (work 20) is still forthcoming. Brill’s print edition of Gregorii Nysseni Opera is the editio maior of Gregory’s works. References to page and line numbers of Gregory’s works follow this edition. For that reason, the page and line numbers of the print edition are maintained in the online edition. Lines are of the same length, and can be found on the same page, as in the print edition. To the left of the text in Gregorii Nysseni Opera Online are several types of marginalia. They are 1) references to previous editions, such as Migne page numbers, in bold; 2) line and caput numbers of Gregorii Nysseni Opera; 3) lemmata of Lexicon Gregorianum. In most cases, line numbers are hyperlinks to the apparatus criticus which is positioned below the Greek text. The hyperlink takes you to the critical notes that pertain to a particular line (on a particular page of a particular work). The critical notes are preceded by a line number. That is a hyperlink that takes you back to the text. In this way you can easily jump back and forth between text and apparatus criticus. Footnotes contain the apparatus fontium et testimoniorum and other such remarks. These, too, are connected to the text with bidirectional hyperlinks. Note, by the way, that the index siglorum is part of the prefaces. One type of marginalia are lemmata from Brill’s Lexicon Gregorianum. This publication, too, is available on BrillOnline Reference works. The lemmata are thus links to Lexicon Gregorianum Online. Vice versa, the lexicon – which quotes Gregory’s work extensively to illustrate the meaning of terms – contains numerous hyperlinks to Gregorii Nysseni Opera Online.